American soldier, and eighteenth president of the United States, was born at Point Pleasant, Ohio, on the 27th of April 1822. He was a descendant of Matthew Grant, a Scotchman, who settled in Dorchester, Massachusetts, in 1630. His earlier years were spent in helping his father, Jesse R. Grant, upon his farm in Ohio. In 1839 he was appointed to a place in the military academy at West Point, and it was then that his name assumed the form by which it is generally known. He was christened Hiram, after an ancestor, with Ulysses for a middle name. As he was usually called by his middle name, the congressman who recommended him for West Point supposed it to be his first name, and added to it the name of his mother's family, Simpson. Grant was the best horseman of his class, and took a respectable place in mathematics, but at his graduation in 1843 he only ranked twenty-first in a class of thirty-nine. In September 1845 he went with his regiment to join the forces of General Zachary Taylor in Mexico; there he took part in the battles of Palo Alto, Resaca de la Palma and Monterey, and, after his transfer to General Winfield Scott's army, which he joined in March 1847, served at Vera Cruz, Cerro Gordo, Churubusco, Molino del Rey and at the storming of Chapultepec. He was breveted first lieutenant for gallantry at Molino del Rey and captain for gallantry at Chapultepec. In August 1848, after the close of the war, he married Julia T. Dent, and was for a while stationed in California and Oregon, but in 1854 he resigned his commission. His reputation in the service had suffered from allegations of intemperate drinking, which, whether well founded or not, certainly impaired his usefulness as a soldier. For the next six years he lived in St. Louis, Missouri, earning a scanty subsistence by farming and dealings in real estate. In 1860 he removed to Galena, Illinois, and became a clerk in a leather store kept by his father. At that time his earning capacity seems not to have exceeded $800 a year, and he was regarded by his friends as a broken and disappointed man. He was living at Galena at the outbreak of hostilities between the North and South. To the "call to arms" of 1861 Grant promptly responded. After some delay he was commissioned colonel of the 21st Illinois regiment and soon afterwards brigadier-general. He was shortly assigned to a territorial command on the Mississippi, and first won distinction by his energy in seizing, on his own responsibility, the important point of Paducah, Kentucky, situated at the confluence of the two great waterways of the Tennessee and Ohio (6th of September 1861). On the 7th of November he fought his first battle as a commander, that of Belmont (Missouri), which, if it failed to achieve any material result, certainly showed him to be a capable and skillful leader. Early in 1862 he was entrusted by General Henry W. Halleck with the command of a large force to clear the lower reaches of the Cumberland and the Tennessee, and, whatever criticism may be passed on the general strategy of the campaign, Grant himself, by his able and energetic work, thoroughly deserved the credit of his brilliant success at Fort Donelson, where 15,000 Confederates were forced to capitulate. Grant and his division commanders were promoted to the rank of major-general U.S.V. soon afterwards, but Grant's own fortunes suffered a temporary eclipse owing to a disagreement with Halleck. When, after being virtually under arrest, he rejoined his army, it was concentrated about Savannah on the Tennessee, preparing for a campaign towards Corinth, Mississippi. On the 6th of April 1862 a furious assault on Grant's camps brought on the battle of Shiloh. After two days' desperate fighting the Confederates withdrew before the combined attack of the Army of the Tennessee under Grant and the Army of the Ohio under Don Carlos Buell. But the Army of the Tennessee had been on the verge of annihilation on the evening of the first day, and Grant's leadership throughout was by no means equal to the emergency, though he displayed his usual personal bravery and resolution. In the grand advance of Halleck's armies which followed Shiloh, Grant was relieved of all important duties by his assignment as second in command of the whole force, and was thought by the army at large to be in disgrace. But Halleck soon went to Washington as general-in-chief, and Grant took command of his old army and of William S. Rosecrans's Army of the Mississippi. Two victories (Iuka and Corinth) were won in the autumn of 1862, but the credit of both fell to Rosecrans, who commanded in the field, and the nadir of Grant's military fortunes was reached when the first advance on Vicksburg, planned on an unsound basis, and complicated by a series of political intrigues (which had also caused the adoption of the original scheme), collapsed under the minor reverses of Holly Springs and Chickasaw Bayou (December 1862). 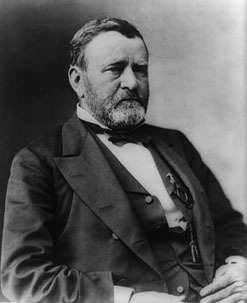 It is fair to assume that Grant would have followed other unsuccessful generals into retirement, had he not shown that, whatever his mistakes or failures, and whether he was or was not sober and temperate in his habits, he possessed the iron determination and energy which in the eyes of Abraham Lincoln and Edwin M. Stanton, and of the whole Northern people, was the first requisite of their generals. He remained then with his army near Vicksburg, trying one plan after another without result, until at last after months of almost hopeless work his perseverance was crowned with success -- a success directly consequent upon a strange and bizarre campaign of ten weeks, in which his daring and vigor were more conspicuous than ever before. On the 4th of July 1863 the great fortress surrendered with 29,491 men, this being one of the most important victories won by the Union arms during the whole war. Grant was at once made a major-general in the regular army. A few months later the great reverse of Chickamauga created an alarm in the North commensurate with the elation that had been felt at the double victory of Vicksburg and Gettysburg, and Grant was at once ordered to Chattanooga, to decide the fate of the Army of the Cumberland in a second battle. Four armies were placed under his command, and three of these concentrated at Chattanooga. On the 25th of November 1863 a great three day battle ended with the crushing defeat of the Confederates, who from this day had no foothold in the center and west. After this, in preparation for a grand combined effort of all the Union forces, Grant was placed in supreme command, and the rank of lieutenant-general revived for him (March 1864). Grant's headquarters henceforth accompanied the Army of the Potomac, and the lieutenant-general directed the campaign in Virginia. This, with Grant's driving energy infused into the best army that the Union possessed, resolved itself into a series, almost uninterrupted, of terrible battles. Tactically the Confederates were almost always victorious, strategically, Grant, disposing of greatly superior forces, pressed back Robert E. Lee and the Army of Northern Virginia to the lines of Richmond and Petersburg, while above all, in pursuance of his explicit policy of "attrition", the Federal leader used his men with a merciless energy that has few, if any, parallels in modern history up to that time. At Cold Harbor six thousand men fell in one useless assault lasting an hour, and after two months the Union armies lay before Richmond and Petersburg indeed, but had lost no fewer than 72,000 men. But Grant was unshaken in his determination. "I purpose to fight it out on this line, if it takes all summer", was his message from the battlefield of Spottsylvania to the chief of staff in Washington. Through many weary months he never relaxed his hold on Lee's army, and, in spite of repeated partial reverses, that would have been defeats for his predecessors, he gradually wore down his gallant adversary. The terrible cost of these operations did not check him; only on one occasion of grave peril were any troops sent from his lines to serve elsewhere, and he drew to himself the bulk of the men whom the Union government was recruiting by the thousands for the final effort. Meanwhile all the other campaigns had been closely supervised by Grant, preoccupied though he was with the operations against his own adversary. At a critical moment he actually left the Virginian armies to their own commanders, and started to take personal command in a threatened quarter, and throughout he was in close touch with William T. Sherman and George Henry Thomas, who conducted the campaigns on the southeast and the center. That he succeeded in the efficient exercise of the chief command of armies of a total strength of over one million men, operating many thousands of miles apart from each other, while at the same time he watched and manoeuvred against a great captain and a veteran army in one field of the war, must be the greatest proof of Grant's powers as a general. In the end complete success rewarded the sacrifices and efforts of the Federals on every theater of war; in Virginia, where Grant was in personal control, the merciless policy of attrition wore down Lee's army until a mere remnant was left for the final surrender. Grant had thus brought the great struggle to an end, and was universally regarded as the savior of the Union. A careful study of the history of the war thoroughly bears out the popular view. There were soldiers more accomplished, as was George B. McClellan, more brilliant, as was Rosecrans, and more exact, as was Buell, but it would be difficult to prove that these generals, or indeed any others in the service, could have accomplished the task which Grant brought to complete success. Nor must it be supposed that Grant learned little from these three years' campaigning in high command. There is less in common than is often supposed between the buoyant energy that led Grant to Shiloh and the grim plodding determination that led him to Vicksburg and to Appomattox. Shiloh revealed to Grant the intensity of the struggle, and after that battle, appreciating to the full the material and moral factors with which he had to deal, he gradually trained his military character on those lines which alone could conduce to ultimate success. Singleness of purpose, and relentless vigor in the execution of the purpose, were the qualities necessary to the conduct of the vast enterprise of subduing the Confederacy. Grant possessed or acquired both to such a degree that he proved fully equal to the emergency. If in technical finesse he was surpassed by many of his predecessors and his subordinates, he had the most important qualities of a great captain, courage that rose higher with each obstacle, and the clear judgment to distinguish the essential from the minor issues in war. After the assassination of President Lincoln a disposition was shown by his successor, Andrew Johnson, to deal severely with the Confederate leaders, and it was understood that indictments for treason were to be brought against General Lee and others. Grant, however, insisted that the United States government was bound by the terms accorded to Lee and his army at Appomattox. He went so far as to threaten to resign his commission if the president disregarded his protest. This energetic action on Grant's part saved the United States from a foul stain upon its escutcheon. In July 1866 the grade of general was created, for the first time since the organization of the government, and Grant was promoted to that position. In the following year he became involved in the deadly quarrel between President Johnson and Congress. To tie the president's hands Congress had passed the Tenure of Office Act, forbidding the president to remove any cabinet officer without the consent of the Senate; but in August 1867 President Johnson suspended Secretary Stanton and appointed Grant secretary of war ad interim until the pleasure of the Senate should be ascertained. Grant accepted the appointment under protest, and held it until the following January, when the Senate refused to confirm the president's action, and Secretary Stanton resumed his office. President Johnson was much disgusted at the readiness with which Grant turned over the office to Stanton, and a bitter controversy ensued between Johnson and Grant. Hitherto Grant had taken little part in politics. The only vote which he had ever cast for a presidential candidate was in 1856 for James Buchanan; and leading Democrats, so late as the beginning of 1868, hoped to make him their candidate in the election of that year; but the effect of the controversy with President Johnson was to bring Grant forward as the candidate of the Republican party. At the convention in Chicago on the 20th of May 1868 he was unanimously nominated on the first ballot. The Democratic party nominated the one available Democrat who had the smallest chance of beating him -- Horatio Seymour, lately governor of New York, an excellent statesman, but at that time hopeless as a candidate because of his attitude during the war. The result of the contest was at no time in doubt; Grant received 214 electoral votes and Seymour 80. The most important domestic event of Grant's first term as president was the adoption of the fifteenth amendment to the Constitution on the 30th of March 1870, providing that suffrage throughout the United States should not be restricted on account of race, color or previous condition of servitude. The most important event in foreign policy was the treaty with Great Britain of the 8th of May 1871, commonly known as the Treaty of Washington, whereby several controversies between the United States and Great Britain, including the bitter questions as to damage inflicted upon the United States by the "Alabama" and other Confederate cruisers built and equipped in England, were referred to arbitration. In 1869 the government of Santo Domingo (or the Dominican Republic) expressed a wish for annexation by the United States, and such a step was favored by Grant, but a treaty negotiated with this end in view failed to obtain the requisite two-thirds vote in the Senate. In May 1872 something was done towards alleviating the odious Reconstruction laws for dragooning the South, which had been passed by Congress in spite of the vetoes of President Johnson. The Amnesty Bill restored civil rights to all persons in the South, save from 300 to 500 who had held high positions under the Confederacy. As early as 1870 President Grant recommended measures of civil service reform, and succeeded in obtaining an act authorizing him to appoint a Civil Service commission. A commission was created, but owing to the hostility of the politicians in Congress it accomplished little. During the fifty years since Crawford's Tenure of Office Act was passed in 1820, the country had been growing more and more familiar with the spectacle of corruption in high places. The evil rose to alarming proportions during Grant's presidency, partly because of the immense extension of the civil service, partly because of the growing tendency to alliance between spoilsmen and the persons benefited by protective tariffs, and partly because the public attention was still so much absorbed in Southern affairs that little energy was left for curbing rascality in the North. The scandals, indeed, were rife in Washington, and affected persons in close relations with the president. Grant was ill-fitted for coping with the difficulties of such a situation. Along with high intellectual powers in certain directions, he had a simplicity of nature charming in itself, but often calculated to render him the easy prey of sharpers. He found it almost impossible to believe that anything could be wrong in persons to whom he had given his friendship, and on several occasions such friends proved themselves unworthy of him. The feeling was widely prevalent in the spring of 1872 that the interests of pure government in the United States demanded that President Grant should not be elected to a second term. This feeling led a number of high-minded gentlemen to form themselves into an organization under the name of Liberal Republicans. They held a convention at Cincinnati in May with the intention of nominating for the presidency Charles Francis Adams, who had ably represented the United States at the court of St. James's during the Civil War. The convention, was, however, captured by politicians who converted the whole affair into a farce by nominating Horace Greeley, editor of the New York Tribune, who represented almost anything rather than the object for which the convention had been called together. The Democrats had despaired of electing a candidate of their own, and hoped to achieve success by adopting the Cincinnati nominee, should he prove to be an eligible person. The event showed that while their defeat in 1868 had taught them despondency, it had not taught them wisdom; it was still in their power to make a gallant fight by nominating a person for whom Republican reformers could vote. But with almost incredible fatuity, they adopted Greeley as their candidate. As a natural result Grant was re-elected by an overwhelming majority. The most important event of his second term was his veto of the Inflation Bill in 1874 followed by the passage of the Resumption Act in the following year. The country was still laboring under the curse of an inconvertible paper currency originating with the Legal Tender Act of 1862. There was a considerable party in favor of debasing the currency indefinitely by inflation, and a bill with that object was passed by Congress in April 1874. It was promptly vetoed by President Grant, and two months later he wrote a very sensible letter to Senator J. P. Jones of Nevada advocating a speedy return to specie payments. The passage of the Resumption Act in January 1875 was largely due to his consistent advocacy, and for these measures he deserves as high credit as for his victories in the field. In spite of these great services, popular dissatisfaction with the Republican party rapidly increased during the years 1874-76. The causes were twofold: firstly, there was great dissatisfaction with the troubles in the Southern states, owing to the harsh Reconstruction laws and the robberies committed by the carpet-bag governments which those laws kept in power; secondly, the scandals at Washington, comprising wholesale frauds on the public revenue, awakened lively disgust. In some cases the culprits were so near to President Grant that many persons found it difficult to avoid the suspicion that he was himself implicated, and never perhaps was his hold upon popular favor so slight as in the summer and autumn of 1876. After the close of his presidency in the spring of 1877 Grant started on a journey around the world, accompanied by his wife and one son. He was received with distinguished honors in England and on the continent of Europe, from where he made his way to India, China and Japan. After his return to America in September 1880 he went back to his old home in Galena, Illinois. A faction among the managers of the Republican party attempted to secure his nomination for a third term as president, and in the convention at Chicago in June 1880 he received a vote exceeding 300 during 36 consecutive ballots. Nevertheless, his opponents made such effective use of the popular prejudice against third terms that the scheme was defeated, and James Garfield was named in his stead. In August 1881 General Grant bought a house in the city of New York. his income was insufficient for the proper support of his family, and accordingly he had become partner in a banking house in which one of his sons was interested along with other persons. The name of the firm was Grant and Ward. The ex-president invested in it all his available property, but paid no attention to the management of the business. His facility in giving his confidence to unworthy people was now to be visited with dire calamity. In 1884 the firm became bankrupt, and it was discovered that two of the partners had been perpetrating systematic and gigantic frauds. This severe blow left General Grant penniless, just at the time when he was beginning to suffer acutely from the disease which finally caused his death. Down to this time he had never made any pretensions to literary skill or talent, but on being approached by the Century Magazine with a request for some articles he undertook the work in order to keep the wolf from the door. It proved a congenial task, and led to the writing of his Personal Memoirs, a frank, modest and charming book, which ranks among the best standard military biographies. The sales earned for the general and his family something like half a million dollars. The circumstances in which it was written made it an act of heroism comparable with any that Grant ever showed as a soldier. During most of the time he was suffering tortures from cancer in the throat, and it was only four days before his death that he finished the manuscript. In the spring of 1885 Congress passed a bill creating him a general on the retired list; and in the summer he was removed to a cottage at Mount McGregor, near Saratoga, where he passed the last five weeks of his life, and where he died on the 23rd of July 1885. His body was placed in a temporary tomb in Riverside Drive, New York City, overlooking the Hudson river. Grant showed many admirable and lovable traits. There was a charming side to his trustful simplicity, which was at times almost like that of a sailor set ashore. He abounded in kindliness and generosity, and if there was anything especially difficult for him to endure, it was the sight of human suffering, as was shown on the night at Shiloh, where he lay out of doors in the icy rain rather than stay in a comfortable room where the surgeons were at work. His good sense was strong, as well as his sense of justice, and these qualities stood him in good service as president, especially in his triumphant fight against the greenback monster. Altogether, in spite of some shortcomings Grant was a massive, noble and lovable personality, well fitted to be remembered as one of the heroes of a great nation.